Each December, in an effort to celebrate outstanding achievements and commemorate The Year That Was, the pop culture media industrial complex foists lots of lists upon the world. 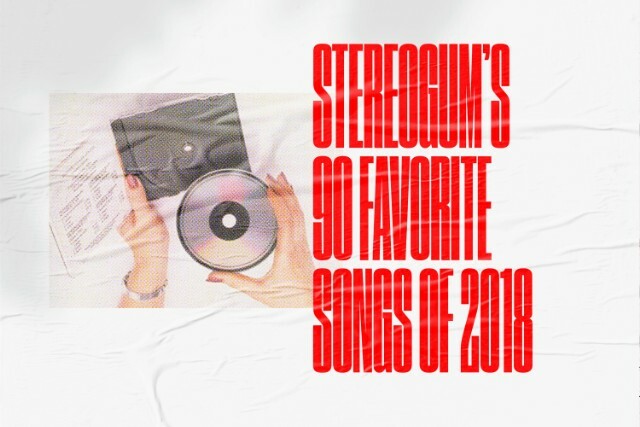 We here at Stereogum are party to that deluge; we shared our collective conclusions about 2018’s best albums a week ago and have been keeping the year-end #content coming ever since. Today we’re back with a roundup of songs we loved. As has become our tradition, this one is not a list so much as a collection of lists. Rather than try to come up with a staff-wide consensus on the best tracks of 2018, we instead present individual playlists of tunes that stirred our spirits and dominated our listening. In keeping with precedent, a song could only appear on one person’s list, so no matter how many of us wanted “Me & My Dog,” there could only be one. After politely sorting out who got that one and a few other in-demand anthems, this is what we came up with. I got my first MP3 player 20 years ago this month. It was the Rio PMP300, which held a whopping eight New Radicals songs once I bought an additional flash memory card. When I realized it could connect to my car stereo with a cassette adaptor it changed my life. But here’s what’s even funnier: After all this time and technological upheaval, I still listen almost exclusively to MP3s. I pay for Apple Music and Amazon Music Unlimited and I get advance press streams, but I don’t trust the cloud nor wifi availability, so I’m always downloading rars and ripping YouTubes and buying things on Bandcamp or iTunes. Artists might be disappointed to learn I listen to all that compressed audio on Apple EarPods, and they’d probably be less than thrilled to know I also listen to everything on shuffle. Anyway, in spite of this byzantine system for familiarizing myself with new music, I was sold immediately on “no tears left to cry.” My favorite part is when Ariana majorizes the vi chord in the intro. My second favorite part is when she says “yuh.” “Into You” was my favorite track of 2016, so maybe this is the year I accepted I am an Arianator. “Binary is banal.” That’s a circa-2004 quote courtesy of an anonymous online entity purporting to speak on behalf of someone called “Andrew W.K.” In its original context, the statement sounded like hyperbolic nonsense, but in retrospect, it would prove to be the pithy tagline for W.K.’s career-long Cartesian existentialist experiment in objective reality (or lack thereof), which argues against our commonly held concept of a fixed “identity.” In brief: It’s an illusory outgrowth of inherently flawed dualistic thinking. Briefer: It doesn’t exist and should be ignored. In fairness, these ideas don’t lend themselves to brevity. Trust me. I spent a whole lot of 2018 immersed in W.K.’s philosophy. It was far from brief. It was consuming. Coincidentally or not, much of my own favorite music of 2018 rebelled against established stereotypic parameters and/or refused to conform to market-dictated confines: Rolo Tomassi, the Armed, the Voidz, Holy Fawn, Pagan, Svalbard … even AWK himself. None of those albums belonged to any extant genre — they lived in a liminal emptiness that a circa-2018 Andrew W.K. called “Total Freedom” — and they often treated the very notion of “genre” as an institution to be vandalized, looted, torn apart from the inside, and razed to the ground. With the old boxes, cells, walls, and laws reduced to ash, all that remained were the songs. And the best of those songs were absolute motherfuckers. I gotta be honest with you guys: I wanted to make this list a lot longer. As usual, I could have easily built a great list out of songs my coworkers seized from me in our annual shakedown — you might say I’d love it if I made that list, wink wink, nudge nudge, etc. etc. — but beyond that, 10 songs just feels exceptionally limiting in a year when I loved music more ecumenically than ever. There were so many releases I loved that somehow weren’t represented in any of our year-end coverage, records by Big Red Machine and the Internet and Nothing and Maxo Kream and Dilly Dally, for instance. Those and so many others deserved a shout-out. That said, I vouch for these 10 tunes in particular, especially “Space Cowboy,” a glimmering tearjerker at the center of a satisfied sigh of an album. I played each one of them repeatedly this year: while typing away in my office, while driving through the dark, while dancing with my wife and kids in the living room. (I’ll let you guess which songs thrived in which contexts.) So although I still feel like I’m scratching the surface on what 2018 had to offer, these songs are a great place to start. This year, I focused on finding stability. I started routines and I stuck with them and I went hiking and I went out less. Basically, I became more boring. None of the songs on this album adhere to any theme in particular, but they all remind me of moments I spent with the people who are most important to me. I can pinpoint memories when I listen to this playlist, like driving through the Catskills to “Burger Hill”; painting my new apartment while trying to rap Bad Bunny’s verse on “I Like It”; leading a rousing singalong of “Shallow” at a Halloween party; way too fucked up in a yellow cab playing “Honey” off my phone speakers; screaming “I WANNA BE EMACIATED!” anytime, anywhere. These songs make me instantly nostalgic, which is basically the best feeling even if it makes you a little sad. What a weird year for music! There were a lot of albums that I really, really, really liked this year, though not too many I’d call outright classics. But I feel like I listened to and enjoyed more music than I have in a while, and I really wanted my favorite songs rundown to reflect that. So I decided to do something a little different with it. Instead of including a bunch of songs whose makers already popped up on our big albums and EPs lists, here are 10 songs by artists who didn’t make the cut for one reason or another but still put out some excellent tunes this year. There’s nothing really tying all of these together — though it most definitely is an accurate representation of my interests — but all of these songs have stuck with me throughout the last 12 months. All of them are part of albums that are also great, and a lot of them come from fresh young talent whose music will only get better with time. Also special shoutout to Devi McCallion and Katie Dey’s “No One’s In Control,” which definitely would have been on here if it was on Spotify! See ya in 2019. This year, I transitioned from being Stereogum’s nights and weekends writer to being a regular old daytime staff writer. This meant a lot of changes in my life, including a late introduction to the wonders and joys of the commuter lifestyle. There are a lot of things I could say about commuting to work via the New York City subway every morning, most of them not particularly flattering. But one thing that the daily train ride does offer is ~40 glorious minutes of largely uninterrupted music listening and/or book reading time, and that, my friends, is no small thing. Many of my favorite songs of 2018 were songs that I listened to over and over again on that train ride. Whether they were futuristic pop bangers like “Immaterial” and “Hot Pink,” intoxicating dream-world bangers like “Spells” and “Rosebud,” smoothly funky bangers like “Just A Stranger” and “Black Balloons,” barnstorming punk-rock bangers like “Raise Your Voice Joyce,” or wistful indie-rock bangers like “Heat Wave,” they all had the power to transform the entire rest of my day. And yes — they were all bangers. When your workday starts at 3PM and ends at 11, you end up spending a lot of time alone. Party anthems become personal anthems. Your headphones seem to dictate your empty city like a movie soundtrack. My favorite songs this year were ones that I could fully inhabit. Frances Quinlan’s words conjure a tree-lined pop-up storybook on “Not Abel.” “Sicko Mode” is a different kind of storybook, a twisted tale with Drake handling the foreword and epilogue. I played “Focus” on repeat until the beat was pumping through my brain. I let myself believe that Kero Kero Bonito wrote “Only Acting” specifically for me. Mitski and Soccer Mommy lent their quiet resilience late at night, Parquet Courts colored me agitated and melancholy by day. The way that I process music changed in 2018, a development owed to the enveloping voices and sounds I chose to put in my ears and the eight people I get to parse them with online every day. Roll credits. Listen to a playlist of all our staffer’s favorite songs on Spotify.